The Outdoor Power Equipment Institute of Canada (OPEIC) is conducting public consultations on the renewal of its Stewardship Plan for Electric Outdoor Power Equipment from March 11, 2019 to April 25, 2019. The Electric Outdoor Power Equipment Stewardship Program is the approved product stewardship program for electric outdoor power equipment in British Columbia, managed by OPEIC pursuant to the BC Recycling Regulation. In its review of the stewardship plan submitted by OPEIC in 2018, the Ministry of Environment and Climate Change Strategy (MoECCS) stated the program needed to establish greater performance measures that demonstrate the effectiveness of the plan. The consultation will present proposed amendments to the stewardship plan in response to concerns identified by the MoECCS. Starting today, a copy of the stewardship plan will be available for review and download at www.opeic.ca. OPEIC will be conducting webinars on the following dates, which are open to all interested stakeholders. Stakeholders must register in advance to participate in a webinar. To register, please click on the webinar that you wish to attend and you will be directed to a registration portal. Encorp Pacific (Canada) is the not-for-profit stewardship agency appointed by producers of packaged ready-to-drink beverages to fulfill their obligations under the Recycling Regulation, Schedule 1, Beverage Container Product Category (B.C. Reg. 449/2004). The stewardship plan covers all the regulated containers for ready-to-drink beverages sold in British Columbia, except refillable beer bottles and beer aluminum cans. This includes soft drinks, juice, water, wine, coolers and spirits among other drink categories. The proposed 2019 - 2022 program targets are presented in the document and can be found on our website. The initial public consultation on this proposed plan was conducted between May 8, 2018 and June 22, 2018. As a result of the consultation process and discussions with the Ministry of Environment and Climate Change Strategy, Encorp has further revised and expanded the categories of the proposed recovery rates. We are seeking your input on these newly proposed recovery rate targets. Visit www.return-it.ca/consultation2018 for more details, downloadable documents. Consultation will conclude on April 30, 2019 at which time Encorp will review and consider all input, and then submit the final performance targets for consideration by the Statutory Decision Maker. Canadian students and their families are being encouraged to celebrate Earth Day 2019 by recycling old and unwanted cell phones for the Earth Month Challenge. With families purchasing new cell phones every year, old phones are being stored away instead of being used or recycled. Statistics show that more than 60 percent of Canadians have multiple cell phones in their possession that they aren’t currently using. 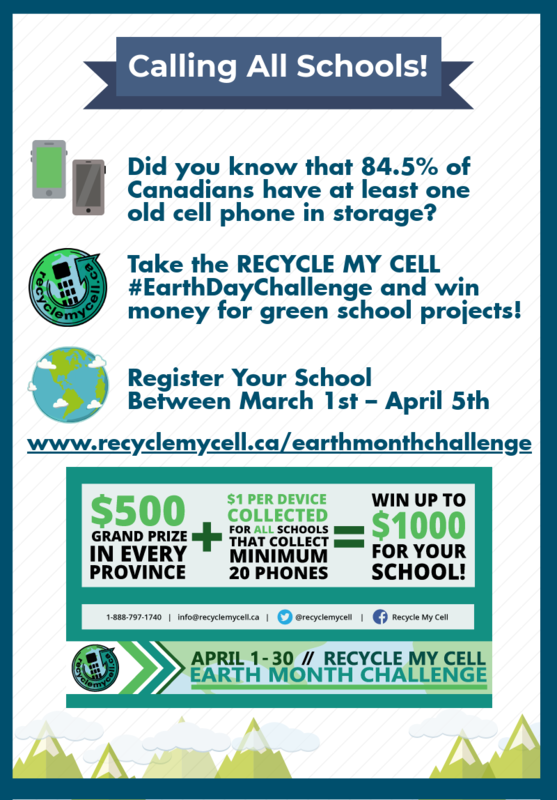 The Earth Month Challenge gives Canadians the opportunity to raise money for their schools and prevent old or unwanted cell phones from ending up in the family junk drawer or in landfills by recycling them. Registration for schools is now open across the country, and the challenge officially runs from April 1-30. Cell phones collected at other times of the year are ineligible for the Earth Month Challenge, but are still eligible for free recycling at a Recycle My Cell drop off location. Nominations are now open for the 20th annual RCBC MOBI Environmental Awards. The awards celebrate achievements of British Columbians striving to work towards a world without waste. We are looking for a highly organized, energetic and outgoing Events and Communications Lead to help elevate the success of the ElectroRecycle program. Reporting to the Program Manager, the successful candidate will be a responsible and reliable self-starter who is eager to explore all communications and events opportunities and loves to learn, test and improve. Recycling Depot operating Encorp, ElectroRecycle, Recycle BC and Regeneration programs. One of North America’s leading source for refuse rental trucks. We offer Front Loaders, Side Loaders, Rear Loaders and Roll-Off garbage trucks, all backed by the only nationally serviced and maintained rental fleet in the industry. BCUOMA has released its draft Product Stewardship Plan for consultation. Comments can be submitted to David Lawes by email dlawes@usedoilrecycling.ca and will be received until June 30th, 2018. In 2010, Call2Recycle Canada, Inc.’s stewardship plan for the collection and recycling of consumer batteries was approved by the British Columbia Ministry of the Environment. As required by the government, Call2Recycle will be submitting its renewal plan for review and approval. In preparation of our plan submission, we invite you to participate in the consultation process by reviewing the renewal plan and/or participating in one of two webinars Call2Recycle will be hosting on June 13 and June 21. To register for the webinars, please select and click one of the dates below (to be taken to the attendee registration login page). Please submit comments regarding the plan to bcplan@call2recycle.ca no later than July 6th. Visit www.returnit.ca/consultation2018 for more details, downloadable documents. Feedback submissions on Recycle BC's revised Packaging and Paper Product Extended Producer Responsibility Plan are welcome until May 14, 2018. Please submit feedback through our online Stakeholder Feedback Form or via email at consultation@recyclebc.ca. The presentation and recording of the April 17 overview webinar are available online here. The revised Plan contains enhancements designed to support Recycle BC's ongoing and future success and reflect discussions and comments from its two-day consultation with stakeholders in November, 2017. Section 6 of the Recycling Regulation requires that every five years Recycle BC review its approved Plan and submit proposed amendments to the government of British Columbia for review and approval. Proposed material-specific recovery rates for paper, plastic, glass and metal. The consultation process for TSBC’s next five year plan has been initiated with the publication of the draft plan on the TSBC web site. As per the BC Recycling Regulation, TSBC is required to post the draft plan for comment for 45 days. Please submit your comments in writing to Rosemary Sutton, Executive Director at rsutton@tsbc.ca before June 8th, 2018. TSBC will also be hosting 2 webinars: May 16th at 10am and June 5th at 11am. Details and links to these events will be posted on the web site here and under the News Corner section of our web site. The 2018 - 2022 program targets are presented in the attached document and can also be found on our website. Input can be submitted at any time during the consultation period May 8 – June 22, 2018 through our online web app. In addition we will conduct a webinar on May 16, 2018 and hold a public meeting on May 30, 2018. The BC Used Oil Management Association (BCUOMA) is pleased to announce an increase in grant funding available to BC Regional Districts, Municipalities and community recycling organizations for their planning, coordination and execution of Community Collection or “Round-up” days. Several BC communities currently hold round-ups or community collection events for a wide range of products and materials, including household hazardous waste. BCUOMA currently sponsors some of these events to support the collection of oil and antifreeze by providing $500 per event. BCUOMA has now increased that support to $1500 per event to increase the number of events and improve support for existing events. If you are interested in applying for a Round-up Grant, please send an e-mail request to Sharon Pearce, BCUOMA’s Consumer Recycling Program lead at spearce@usedoilrecycling.ca . • and indicate if other stewardship associations will be participating. The CBA’s updated Refrigeration Units Stewardship Plan (2018) was posted on the association’s website on Thursday, March 29, 2018. Comments on the plan are welcome from all members of the public. To provide your comments, please call (416) 362-2424, or email Shane Buckingham at shane@canadianbeverage.ca. If you are an RCBC member, in good standing, in the Government and Business Sectors and are considering nomination to the Board of Directors, please read the 2018 RCBC Board Nominations Package carefully, so that you become familiar with the purpose of the organization and its system of elections and governance. The two year board term (per Bylaw 3.1.3) will run from May 30, 2018 to the date of the 2020 AGM. For a listing of the incumbent RCBC Board Members in the Business and Government Sectors, visit the board section of the RCBC Website. 1. Demonstrate expertise in the field of recycling, waste reduction, solid waste management or a related area, or expertise in a field relevant to the operation of RCBC (e.g. management, finance, law, government, public process). 2. Agree that as a board member he or she will conform to the policies, aims, and objectives laid out in the RCBC constitution and bylaws and policy decisions of the organization. 3. Commit to attend a minimum of two-thirds (2/3) of regular board meetings and sit on at least one committee and attend at least two-thirds (2/3) of committee meetings. Regular board and committee meetings are held approximately 5 times per year. Meetings are held at the RCBC offices in Vancouver and may be attended either in person or by conference call. If you are interested in nominating a candidate please download the 2018 RCBC Board Nominations Package, complete the RCBC Board Nomination Form and submit it to the attention of Cheryl Shuman, Chair - Nominations Committee, no later than Friday, March 23, 2018 by 4 p.m., by fax at 604-683-7255, by email at ben@rcbc.ca, or by mail to 10-119 West Pender Street, Vancouver, BC V6B 1S5. All nominees must be RCBC members in good standing. The BC Used Oil Management Association has released an RFP for Community Collection Events across BC. The RFP can be found on our website main page under what’s new - http://bcusedoil.com . Bids can be received to provide service for the whole province or in select regions. BCUOMA is looking to build the Community Collection Events program to be a standard feature in the consumer collection network. As outlined in the RFP, the process closes on February 28th, 2018. There will be a proponent’s teleconference on February 6th, 2018. Reducing Apparel Waste to Disposal: An Industry perspective. Have you ever wondered where your clothes go when you throw them away or donate them? Leverage CAMP is holding a White Paper Release Party in Vancouver on November 2nd for anyone in the textile industry who has a stake in or is impacted by the textile supply chain. For more details and to get tickets for this event check out: https://www.eventbrite.ca/e/leverage-camp-white-paper-release-party-tickets-38158163093. The National Strategy for Safe and Environmentally Sound Disposal of Lamps Containing Mercury Act was passed in Parliament in June 2017. The Act requires the Minister of Environment and Climate Change to develop a national strategy in collaboration with provinces, territories, and other interested governments in Canada and to present the strategy to Parliament by June 2019. To guide development of a national strategy Environment and Climate Change Canada (ECCC) would like to set up meetings with stakeholders on this issue to seek their views. They are seeking engagement with representatives of other governments in Canada, private sector companies involved in the lamp industry and lamp waste management, and non-governmental organizations (NGOs). If you are interested in participating in this initiative please contact Karissa.aubie@canada.ca or Alex Devonish alexander.devonish@canada.ca by November 13. The Recycling Council of BC has compiled an overview of illegal dumping issues across the province. Content includes a backgrounder produced by RCBC, a survey sent out to regional districts, and information collected from delegates at RCBC's annual zero waste conference. The City of Vancouver is inviting businesses, industry representatives, social service agencies, advocacy groups, academia, local governments and other government agencies to register for Roundtable Meetings to provide feedback on options and targets that could be included in a draft Single-Use Item Strategy that will be presented to Council in early 2018. The Roundtable Meetings will provide an opportunity for stakeholders to discuss possible options and targets presented in the City’s consultation paper entitled, “Creating a Single-Use Item Reduction Strategy for Disposable Cups, Take-out Containers and Shopping Bags.” You can also download a copy of the consultation paper at vancouver.ca/zerowaste. The consultation paper is intended to spark a conversation on how the City of Vancouver and stakeholders can work together to develop a made-in-Vancouver solution — one that dramatically reduces single-use items, supports convenient, affordable and accessible alternatives, and could be adopted by other communities as we all work towards zero waste. Feedback on the consultation paper will inform the development of a draft Single-Use Item Reduction Strategy that will be presented to Vancouver City Council in early 2018. Attend a Round table Meeting. Comments and written feedback on the consultation paper will be accepted until December 15, 2017. The City is engaging the public through the City’s citizen advisory committees, schools, Pop-Up City Hall, community events, and a Talk Vancouver survey this fall. Please share this information with your networks. We are encouraging everyone with an interest or role to play in reducing single-use items in Vancouver to take the time to review the consultation paper, attend a meeting and provide their input. The Tire Stewardship of Saskatchewan Inc. (TSS), a newly established non-profit, environmental stewardship organization is looking for its first Executive Director. Responsible to a Board of Directors, the new Executive Director will oversee, manage and enhance tire recycling in Saskatchewan. The TSS took over as Program Operator of the provincial program effective September 1, 2017. Host a Green Party: Celebrate Canada Day while minimizing your environmental footprint! Choose reusable cutlery and plates instead of disposable ones. Use growing plants and summer flowers for natural decor instead of purchasing balloons and disposable items. Buy local foods and drinks made by nearby producers to reduce energy used for transportation. Get Involved: Sign up for initiatives like the Great Canadian Shoreline Cleanup or Adopt-A-Street to make a difference in your community. Pledge to get involved in annual green events during Earth Day in April or National Waste Reduction Week in October. Or lend a hand year-round by volunteering with local groups like the Society Promoting Environmental Conservation (SPEC) or the Lower Mainland Green Team (LMGT) that work hard to protect our environment! Do you have other ideas and tips on greening Canada Day and beyond? Let us know on Facebook or Twitter (@RecyclingBC), or give us a call at the BC Recycling Hotline at 604-RECYCLE (732-9253) in the Lower Mainland, or toll-free at 1-800-667-4321. June 29, 2017 – Vancouver. The Recycling Council of British Columbia (RCBC) has announced the recipients of its 2017 annual environmental awards. Known as the MOBIs, after the Mobius Loop recycling symbol of chasing arrows, the awards were presented by RCBC’s Information Services Manager Harvinder Aujala during the organization’s 43rd annual zero waste conference in Whistler on June 22nd, 2017. “For over 25 years, the RCBC Environmental Awards have recognized leaders, innovators, and change-makers from across all sectors in British Columbia.” said RCBC’s CEO Brock Macdonald. “The RCBC awards have always been about leadership, leadership that translates ideas and principles into actions. And those actions present a model for others to follow.” Below, are the five recipients of this year’s awards. The Private sector recipient, Clover Earthkind Salon, is a Vancouver hair salon that has been actively reducing their solid waste consumption and diverting recyclable materials away from the landfill for 8 years, and has been zero waste since 2013. Initiatives include composting over 43kg of hair clippings in 2016. Last year the diversion rate at the salon was 99.3% and they generated only 2kg of garbage. In the Public sector category, it was Coast Mountain Bus Company (CMBC) that was recognized. Sustainability initiatives include recycling old uniforms, reducing bus idling time by 35% since 2009, and utilizing a water recycling system for bus washing that reduces water use by 75%. CMBC continues to make efforts in reducing their environmental footprint by adding 26 Hybrid-diesel buses to their fleet this past Earth Day; and half their fleet currently uses cleaner technology. In the Non-Profit sector, DreamRider Productions was recognized for creating plays about environmental issues for kids since 1997. Since 2002, DreamRider has brought live theatre performances to over 200 Metro Vancouver elementary schools and 50,000 children per year at no cost to schools. In 2009 they began expanding their reach throughout BC, across Canada, and beyond, through digital programming. In particular, DreamRider has developed a suite of programs called The Planet Protector Academy, engaging children from grades 3 through 6 with the critical environmental issues of consumption and waste. Specifically, their Zero Heroes module motivates kids to prevent waste, compost food scraps, learn what it means to “buy smart”, and inspire others to take action! In the Innovation category Dell Canada was recognized for their circular approach to managing their products. In summer 2014 Dell launched its closed-loop plastics supply chain: recovering obsolete technology through take back efforts, processing the plastics and molding them into new parts for new computers and monitors. Since then, Dell has created more than 2.5 million kilos of parts from closed-loop plastics globally. Dell is also looking at how other materials can be reused, including the introduction of products made with recycled carbon fiber. These innovative programs supplement their ongoing use of post-consumer recycled-content plastics and, since 2013 have used a cumulative total of 36.2 million pounds of sustainably sourced materials. Dell Canada is focusing on sustainability and social change through their Legacy of Good Plan. A life-time achievement award was presented to retiring Regional District of Kootenay Boundary (RDKB) General Manager of Environmental Services Alan Stanley remotely via Facebook Live. Mr. Stanley, who retires this summer after more than 20 years serving the communities of Nanaimo and RDKB, is also a two time former RCBC board president. His contribution on public policy through his involvement in the RCBC policy development process helped shape the progressive instruments BC now uses to conserve resources and eliminate waste province-wide. Congratulations to all the RCBC Environmental Award winners; and thank you for your contributions towards the protection and preservation of BC’s environment. For more details and photos, please visit www.rcbc.ca/events/rcbc-annual-awards. We invite you to join us for the RCBC Annual General Meeting (AGM) to be held at Westin Whistler during the 2017 RCBC Conference. Time: 3:30 - 4:00 p.m.
You are invited to participate in a public consultation session to discuss the renewal of the product stewardship plan for major appliances in BC (2017 to 2021) prepared by the Major Appliance Recycling Roundtable (MARR). MARR is the approved product stewardship agency for end-of-life major household appliances in British Columbia. The session will be facilitated by MNP, a professional services firm that has been assisting MARR in drafting its plan and engaging stakeholders to gather their feedback. Stakeholder input from this session will be summarized and considered during the preparation of the final version of the plan to be submitted to the Ministry of Environment. A copy of the proposed stewardship plan is available for review here. We invite you to join us for the RCBC Annual General Meeting (AGM) to be held at the 43rd Annual RCBC Conference on June 21, 2017. When: June 21, 2017 at 4:00 p.m. The Agenda and the draft 2016 AGM minutes will be distributed prior to the meeting. As a reminder, only members in good standing are eligible to vote at the AGM. If have not renewed your membership, you have until the RCBC Annual General Meeting to renew your membership to remain in good standing (bylaw 1.30) To confirm your membership status, please contact Ben Ramos, Member Services Manager, at members@rcbc.ca. If you are only attending the AGM, please RSVP your attendance by June 16, 2017 by clicking here. If you are registered for the conference, we look forward to your attendance. Ottawa –Pharmacists in British Columbia helped residents safely destroy 88.7 tonnes of expired or unused medications in 2016, reports the Health Product Stewardship Association (HPSA) which manages the Medications Return Program in the province. “Our aim is to help Canadians easily dispose of their unwanted medications rather than see these items flushed down the toilet or thrown into the garbage where they can damage the environment or endanger others,” said Ginette Vanasse, Executive Director of HPSA. The industry-funded program is celebrating its 20th successful year under HPSA’s tutelage. In a recent survey of 1,200 British Columbians, 88 per cent said they had medications in their home. Twenty-two per cent said they had medications they no longer needed or might not use. “We understand people’s concern about keeping these medications around the house where they may be misused or endanger family members and pets.” Ms. Vanasse said. HPSA’s recovery and disposal programs are available free of charge and taking advantage of them is as simple as dropping by to see your nearest pharmacist. The Health Products Stewardship Association is a not-for-profit, industry-funded association responsible for the safe management and disposal of unwanted medications and sharps devices. In addition to British Columbia, HPSA manages similar programs in Manitoba, Ontario and Prince Edward Island. This is to inform you of the 2017-2019 RCBC Board of Directors Call for Nominations. RCBC had three (3) positions available in the Non-Profit category and two (2) positions available in the Individual category respectively. Since there were only three (3) nominations received in the Non-Profit category and two (2) nominations received in the Individual category, all nominees are therefore acclaimed. The acclaimed Directors in the Non-Profit & Individual sectors will begin their 2-year term and assume their responsibilities after the June 21, 2017 Annual General Meeting at the 2017 RCBC Conference in Whistler, BC. The directors in the Business and Government Sector have 1 year remaining in their 2-year term. If you have any questions about the nominations process, please contact Cheryl Shuman, Nominations Committee Chair, at members@rcbc.ca. MJ Waste Solutions is Zero Waste Consulting Firm our of Sarnia, ON. Orange Bins is a disposal bin rental company servicing Vancouver. We offer 5-20 yard bins for recycling of green waste, drywall, metal, household junk and waste disposal of garbage. Universal Handling Equipment Company Ltd. is a manufacturer and supplier of waste and recycling trucks, containers, and compactors. Salvation Army National Recycling Operations is a worldwide organization that operates 108 thrift stores across Canada and 9 distribution centres. Mira Kim is a graduate of Mechanical Engineering from Western University with a passion and interest in the renewable energy, energy conservation, and waste reduction sectors. Richmond Steel Recycling is a scrap metal recycler that shreds and sorts ferrous and non-ferrous scrap to provide mills and smelters with recycled materials. Sea to Sky Removal specializes in removing unwanted material in a quick and professional manner, serving the business and residential sector with special emphasis on the construction industry. T2 Market Recycle Depot has contracts with Encorp, Product Care, and other organizations to provide residents of Oliver, BC, with a convenient location to meet their recycling needs. Long Walk Manufacturing Ltd. specializes in salvaged materials, lighting and custom furniture made from reclaimed materials. They also deal in vintage audio recycling and keeping as many items in circulation as possible. Rabanco: A Republic Services of BC Company is an industry leader in the non-hazardous solid waste industry. Dell Canada Inc. works with public, large enterprise, small and medium business, and consumer markets to offer IT solutions from the desktop to the data center. Nova Products designs and manufactures waste diversion containers for residential, institutional and commercial sectors. Products include recycle bins, kitchen organics bins, and curbside organics bins for manual curbside collection programs. Nova Products will be a tradeshow exhibitor at #RCBC2017. The Product Care Association of Canada (PCA) will be holding public consultations regarding amendments to the BC Lamps & Lighting Equipment Stewardship Plan (LightRecycle).The BC LightRecycle Program is the approved product stewardship program for all lamp, fixture and ballast waste in British Columbia, managed and operated by PCA pursuant to the BC Recycling Regulation. The current stewardship plan, which expires in 2017, was developed by PCA and approved by the BC Ministry of Environment in 2012.You are invited to participate in consultations on the proposed stewardship plan. Advanced registration is required. A copy of the proposed stewardship plan is available for download and review here.In addition to participating in a webinar, written comments will be accepted up to April 12th, 2017. For further information regarding the BC LightRecycle Stewardship Plan Consultations, please contact Ellen Hayes, Program Coordinator for the BC LightRecycle Program at (778) 331-1012 or ehayes@productcare.org. Product Care Association of Canada (PCA) is currently holding a public consultation regarding amendments to the British Columbia Paint and Household Hazardous Waste (HHW) Stewardship Plan. The BC Paint & Household Hazardous Waste Stewardship Plan is the approved product stewardship program for paint and household hazardous waste in British Columbia, managed and operated by Product Care Association of Canada (PCA) pursuant to the BC Recycling Regulation. The current stewardship plan was submitted to the Ministry of Environment in July 2012. A copy of the proposed stewardship plan is available for download and review here. For further information regarding the BC Paint & HHW Stewardship Plan Consultations, please contact, Gil Yaron, Director of Programs at 778.331.6971 or gil@productcare.org. If you are an RCBC member, in good standing, in the Non-Profit or Individual Sector and are considering nomination to the Board of Directors, please read the 2017 RCBC Board Nominations Package carefully, so that you become familiar with the purpose of the organization and its system of elections and governance. The two year board term (per Bylaw 3.1.3) will run from June 21, 2017 to the date of the 2019 AGM. If you are interested in nominating a candidate please download the 2017 RCBC Board Nominations Package, complete the nomination form and submit it to the attention of Cheryl Shuman, Chair - Nominations Committee, no later than Friday, April 13, 2017 by 4 p.m., by fax at 604-683-7255, by email at ben@rcbc.ca, or by mail to 10-119 West Pender Street, Vancouver, BC V6B 1S5. All nominees must be RCBC members in good standing. The Engineering, Parks & Environment Department requires a temporary full-time Environmental Sustainability Specialist, for a term of approximately 1 year. Membership renewal notices for 2017 were sent out electronically as a downloadable invoice. Please look out for the renewal notice email if you are the designated member contact. We look forward to having you back! For any renewal inquiries, please contact Ben Ramos at 604-683-3009 ext. 314 or e-mail members@rcbc.ca. Since 1974, RCBC has worked with industry professionals in the continuous improvement of BC’s waste reduction efforts, edging closer to zero waste. Towards this objective, the Council promotes circular economy as a strategic systems-thinking approach that integrates a range of measures, methods, and activities that advance this goal. Therefore, RCBC is looking to engage those who have knowledge and expertise in waste reduction, recycling, extended producer responsibility, and activities associated with addressing illegal dumping to participate and share that information with delegates in Whistler June 21-23, 2017. We invite industry sector leaders, economists, entrepreneurs, academics and related professionals working in environmental fields such as organics, product stewardship, and all levels of recycling and waste management to share their ideas, innovations, success stories and knowledge. Be one of the leaders in the wholesale systemic change of managing waste, to a future of optimizing resources within a sustainable circular economic system. The Health Products Stewardship Association (HPSA) will be holding public consultations regarding amendments to its stewardship plan renewals for the period of 2017 to 2021. In-person consultations will be held on Wednesday, October 19, 2016 at 5:00 p.m. at the Coast Waste Management Association conference at Westin Bear Mountain in Victoria, British Columbia. The HPSA is a not-for-profit industry stewardship organization that has been serving 165 stewards since 2000. Its stewardship program is accountable to its members, the general public, and the government of British Columbia, through the Ministry of Environment. The program’s yearly performance can be found in its annual report. The British Columbia Medications Return Plan is the approved product stewardship program for all prescription drugs (all dosage forms), over-the-counter medications (units sold in oral dosage form), and natural health products (units sold in oral dosage form). The current stewardship plan, which was developed by the HPSA, is expiring this December. The current plan was approved by The BC Ministry of Environment in March of 2007. This stewardship program is managed, operated, and maintained by the Health Products Stewardship Association in accordance with the BC Recycling Regulation. Furthermore, a webinar consultation will take place 30 days after the consultation to give the public the opportunity to comment on the revised plan. Please feel free to register for the webinar by e-mailing admin@healthsteward.ca to express your interest in joining. Interested parties will be notified of the details once a date and time is confirmed. For further information regarding the British Columbia Medications Return Plan, please contact Cassidy Johnson, Program Co-ordinator, Health Products Stewardship Association at 613-723-7282 x103, or admin@healthsteward.ca. On October 13, 2016, the Metro Vancouver Zero Waste Committee will consider proposed changes to the Tipping Fee Bylaw for 2017 as described in the Zero Waste Committee October 13th, 2016 Agenda Report, Item 5.4, titled "GVS&DD Tipping Fee and Solid Waste Disposal Regulation Bylaw No. 302, 2016". View the report and proposed bylaw here. The 2017 tipping fees are proposed to remain the same as in 2016 with a few minor exceptions. Other proposed changes to the Tipping Fee Bylaw are described in the report. The stakeholder consultation period on the proposed changes to the Tipping Fee Bylaw for 2017 is now complete – thank you to those who participated in the webinar, workshop or other meetings, or provided written feedback. Consultation activities and feedback are summarized in an attachment to the report. If recommended by the Zero Waste Committee, the proposed 2017 Tipping Fee Bylaw will be considered at the Greater Vancouver Sewerage and Drainage District Board on October 28, 2016 for approval and final adoption. Stakeholders may apply to speak as a delegation to committees or the Board. Learn more on applying as a delegation. Product Care Association of Canada (PCA) will be holding public consultations regarding amendments to the BC Lamps & Lighting Equipment (LightRecycle) and the BC Paint and Household Hazardous Waste (PaintRecycle) stewardship plans for the period 2017 to 2021. In-person consultations will be held on Wednesday, October 18, 2016 at 5:00pm at the Coast Waste Management Association conference, Westin Bear Mountain in Victoria, BC. For more details, download the full consultation notice. The Outdoor Power Equipment Institute of Canada (OPEIC) will be holding public consultations regarding amendments to the British Columbia Outdoor Power Equipment Institute Stewardship Plan for Electric Outdoor Power Equipment (OPEI Stewardship Plan) for the period 2017 to 2021. The consultations will be held on Wednesday, October 19, 2016 at 5:00pm at the Coast Waste Management Association conference, Westin Bear Mountain in Victoria, BC. Plastics are a big part of your recycling bins. This FREE 40-minute webinar will help you find communication tools to connect with your residents and customers, helping them recycle more. Want to know more? Join us - we’ll save a seat for you! At the RCBC Annual General Meeting last May 18, 2016, the member approved a revised RCBC Constitution & Bylaws. It was approved by the BC Registrar on August 24, 2016. The Tipping Fee and Solid Waste Disposal Regulation Bylaw describes solid waste regulations as well as tipping fees for waste and recycling at Metro Vancouver Transfer Stations, and is renewed annually. Webinar on Monday, August 29, 2016 at 2:00pm (PDT): Approximately 1 hour in length, including a 15 minute presentation by Metro Vancouver staff, followed by time for questions and comments. After registering, you will be redirected to a confirmation page containing instructions on joining the webinar, with an option to add it to your Outlook calendar. If you have any technical questions related to joining the meeting, please email Chris.Chong@metrovancouver.org. Workshop at Metro Vancouver head office on Thursday, September 15, 2016 at 10:00 am (PDT): Approximately 2 hours in length, including a presentation by Metro Vancouver, followed by group discussion, questions, and comments. Electronic Products Recycling Association British Columbia (EPRA BC) will be holding a second public consultation for the renewal of the EPRA BC Stewardship Plan which is proposed to renew in 2017. EPRA BC operates as part of EPRA, an industry led, national, not-for-profit organization, and is responsible for managing the end-of-life recycling program on behalf of manufacturers, retailers and distributors of electronics in BC and pursuant to the BC Recycling Regulation. The 2017 RCBC Zero Waste Conference will be held from June 21-23, 2017 at the Westin Whistler Resort and Spa in Whistler, BC. Registration will open in the fall. Check www.rcbcconference.ca for future updates. We invite you to join us for the RCBC Annual General Meeting (AGM) to be held at Fairmont Whistler during the 2016 RCBC Conference. If you already are registered for the #RCBC2016 Conference, we look forward to seeing you there. Registration for the 2016 RCBC Conference is also still available. If you would like to attend the AGM Only, email us at members@rcbc.ca. This is to inform you of the results of the 2016-2018 RCBC Board of Directors. RCBC had three (3) positions available in the Business category and three (3) positions available in the Government category respectively. Since there are more nominees than positions available in Business category, members voted to fill board positions. Only two (2) nominations were received for the Government category and are therefore acclaimed, leaving one (1) seat vacant, which may be appointed by the Board under bylaw 3.4.4. Thank you to everyone who participated in the democratic process by voting this year. The elected and acclaimed Directors in the Business & Government sectors will begin their 2-year term and assume their responsibilities after the May 18, 2016 Annual General Meeting at the 2016 RCBC Conference in Whistler, BC. The directors in the Non-Profit and Individual Sector have 1 year remaining in their 2-year term. If you have any questions about the election process, please contact Cheryl Shuman, Nominations Committee Chair, at members@rcbc.ca. We invite you to join us for the RCBC Annual General Meeting (AGM) to be held at the 42nd Annual RCBC Conference on May 18, 2016. When: May 18, 2016 - 4:30 p.m. The Agenda and the draft 2015 AGM minutes will be distributed prior to the meeting. While a number of small adjustments are recommended to reflect the current state of the organization’s management and governance structure, the primary changes are in the number of seats allocated to the sectors. Due to the change in membership levels in each of the sectors, the recommendation is that one seat now held by the individual sector become allocated to a renamed industry sector. This would provide four seats for industry, three seats for government and nonprofits, and two seats for the individual sector. As well, a 13th seat is to be added for the acclaimed position of past chair. This is to improve a governance provision set out in the current bylaws. Adding a 13th seat negates the complications that can arise during an election if the acclaimed seat occupied is in a sector being voted on in that year. With the addition of a 13th acclaimed seat, each election may now offer a full set of candidates for the sectors up for election in each year. While the numbering system for a number of bylaws has changed in the revised set, we chose to only highlight either new bylaws or those that have had some word changes. If you have any questions on this matter, please contact RCBC CEO Brock Macdonald at brock@rcbc.ca. Please email us at members@rcbc.ca if you are attending the AGM only. If you are registered for the RCBC Conference, we will see you at the AGM. RCBC has three (3) positions available in the Business category and three (3) positions available in the Government category respectively. Since there are more nominees than positions available in Business category, members will vote to fill board positions. Only two (2) nominations were received for the Government category and are therefore acclaimed, leaving one (1) seat vacant, which may be appointed by the Board under bylaw 3.4.4. The voting package will be mailed out on March 17. Return the filled out ballot by either mail or fax by Friday, April 15, 2016. If you have any questions about the balloting process, please contact Cheryl Shuman, Nominations Committee Chair, at members@rcbc.ca. FAQ Friday Episode 6: Who are the members of RCBC? Who are the members of RCBC? RCBC has formed a working group to examine waste diversion and reduction within the Industrial Commercial and Institutional (ICI) Sector. The working group has developed an 18 question survey and is seeking participation and input from all ICI Sector stakeholders. All participants will be anonymous. Aggregated results of the survey will be made public. Those wishing to participate should do so by March 31, 2016. FAQ Friday Episode 5: What's in store for #RCBC2016 conference in Whistler? FAQ Friday Episode 4: Should I start a home compost? Episode 4: Should I start a home compost? Episode 3: What can I do with unused medications? The Recycling Council of British Columbia is now accepting nominations, until March 11, 2016, for the Board of Director positions in two sector categories, Government and Business. If you are an RCBC member, in good standing, in the government or business sector and are considering nomination to the Board of Directors, please read the 2016 RCBC Board Nominations Package carefully, so that you become familiar with the purpose of the organization and its system of elections and governance. The two year board term (per Bylaw 3.1.2) will run from from May 18, 2016 to the date of the 2018 AGM. If you are interested in nominating a candidate please download the 2016 RCBC Board Nominations Package, complete the nomination form and submit it to the attention of Cheryl Shuman, Chair - Nominations Committee, no later than Friday, March 11, 2016 by 5 p.m., by fax at 604-683-7255, by email at ben@rcbc.ca, or by mail to 10-119 West Pender Street, Vancouver, BC V6B 1S5. All nominees must be RCBC members in good standing. FAQ Friday Episode 2: How do I recycle my fridge? Is your fridge running? Well you better run after it! Check out this week's episode as we answer how to recycle the #1 most inquired item on the Recycling Hotline for 2015. Our second video in the series: How do I recycle my Fridge? Launching our FAQ Friday Video Series: Can I put plastic compostable bags in the green bin? Check out our new video series FAQ Friday with RCBC. We will be covering all your most frequently asked waste reduction and recycling questions. Our first video in the series is: Can I put compostable bags in the green bin? Multi-Material BC (MMBC) has released a Request for Proposal (RFP) for curbside and multi-family collection services for residential packaging and printed paper (PPP) in the City of Vancouver and the City of Pitt Meadows, BC (Canada). Qualified firms are invited to submit competitive proposals. The RFP includes four distinct service areas in the City of Vancouver and one service area in the City of Pitt Meadows. Proponents may submit proposals that cover one or more of these service areas, as well as various combinations of service areas (including all applicable households). Collectively, the five service areas represent a total of 114,400 curbside households and 167,300 multi-family households. The service commencement date for all service areas is September 1, 2016. Due to the size and nature of the City of Vancouver service areas, collection for these areas may be phased in over a four month transition period commencing on September 1, 2016 and ending on December 31, 2016. The exact staging of the collection phases will be discussed with the selected proponent during transition planning with MMBC. Qualified firms that submit a written request for the RFP documents will be sent any addenda mailed to proponents, including information on the location of the January 11, 2016 information meeting. The Regional District of Okanagan-Similkameen has sent us a Request for Proposal for Private Sector Organics Management, accessible here, which we wanted to share with you. Due to this RFP overlapping the holidays, please direct all questions or clarifications in writing through info@rdos.bc.ca to ensure you are responded to in a timely manner and to be registered for receipt of Addenda. About the Project: The BC Bottle Depot Operators Collaboration Project was launched in Fall 2015 to find ways in which all recycling depots in British Columbia can collaborate more closely to promote their interests and undertake initiatives that are important to them. Phase 1 of the project, which is now complete, consisted of conducting interviews with 25 depot operators from around the province who shared their thoughts, concerns, and ideas about the future of collaboration between recycling depots in BC. Phase 2 of the project, which is now underway, includes a province-wide online survey that is taking place through the end of December 2015. The survey is intended to explore opinions and attitudes on how all BC depots can more effectively collaborate. We’ve had a lot of interest and a great response to the survey so far. We encourage all depot operators to fill out the survey and make their voices heard. All respondents will have access to the full survey results. A Steering Committee is being formed to lead the Phase 2 work. If you are interested in participating or learning more about the role of the Steering Committee, please send an email to depotcollaboration@gmail.com. Environment and Climate Change Canada is proposing to amend the Export and Import of Hazardous Waste and Hazardous Recyclable Material Regulation to capture waste or recyclable materials that are controlled by the import or transit country but are not otherwise controlled under these regulations. The proposed amendments would also add new conditions for the return of waste or recyclable materials that are refused by an importing or transit country. These amendments will strengthen Canada’s ability to meet its obligations under the Basel Convention. Environment and Climate Change Canada has prepared the attached discussion document outlining details of the proposed amendments, as well as estimates of compliance and administrative costs for regulatees. The Evolving Recycling Tonne – What About Those Plastics! Plastics are the bigger part of your recycling bins. You know it. We know it. And sometimes your residents don't know what to do with it all. You'll also have the opportunity to share comments about recovering plastics in your system. Want to know more? Join us - we’ll save a seat for you! October 8th, 2015 - Product Care Association will be holding public consultations for the renewal of the AlarmRecycle Stewardship Plan (2017 – 2021). BC AlarmRecycle is the approved product stewardship program for residential-use smoke and carbon monoxide (CO) alarms in British Columbia, managed and operated by Product Care Association (PCA) pursuant to the BC Recycling Regulation. The current BC Smoke and Carbon Monoxide Alarm Stewardship Plan (“Program Plan”), which expires at the end of 2016, was developed by PCA and approved by the BC Ministry of Environment in 2011. To register for the webinar please visit here. A copy of the proposed Program Plan is available for download and review here. For further information regarding the BC AlarmRecycle Program Plan Consultations, please contact Christina Jaworski, Program Coordinator for the BC AlarmRecycle Program at 778.331.6975 or christina@productcare.org. Governments from around the world will be meeting this December in Paris, France to discuss international commitments to carbon reductions. The United Nations Climate Change Conference – otherwise known as the 21st Conference of Parties (or “COP21”) – provides a pivotal opportunity to take action. Decisions made at this conference will influence the way we do business, as well as the world in which we do it. The Ministry of Environment recently released an intentions paper and online response form regarding proposed updates to the Guide for the Preparation of Regional Solid Waste Management Plans (guideline), available on the ministry’s municipal waste management plans website. The intentions paper for this guideline describes the ministry’s objectives, the proposed content of the guideline, and opportunities to comment on those intentions before work to draft a new guideline commences.You to are invited participate in a consultation webinar where ministry staff will provide an overview of the propose planning process changes as well as proposed guiding principles, followed by facilitated discussions. There are two opportunities to participate: October 8th 2015 from 10:30 am -12:00 pm (PDT), and November 5th 2015 from 2:00 pm – 3:30 pm (PDT). You may choose to register for either webinar – the information presented will be the same. Register now! CleanFARMS, a national, industry-led agricultural waste stewardship organization, has partnered with CropLife Canada and the Canadian Animal Health Institute (CAHI) to deliver this program to B.C. farmers. The plant science and animal health industries are committed to safely and responsibly collecting and disposing of obsolete pesticides and livestock/equine medications at no cost to farmers. On May 21, 2015 the Ministry of Environment announced that it will be updating the Guide for the Preparation of Regional Solid Waste Management Plans (guideline). The ministry plans on releasing an intentions paper in September 2015 outlining proposed changes to the guideline, which the public, local government and stakeholders will be able to comment on. An information meeting will be held on June 30th, from 10:00 am to 10:30 am (PDT) where ministry staff will give a 10 minute presentation followed by a question and answer period. The presentation will provide information on the scope, consultation and timeline for the guideline update. To register for the meeting and you will receive a confirmation email containing information about joining the webinar. If you have any technical questions related to joining the meeting, please contact Cindy Bertram at cindybertram@telus.net, or 250-912-9995. Jun 30, 2015 at 10:00 AM PDT. During the RCBC 41st annual conference in Whistler May 6-8, 2015 there were a number of participatory sessions focused on the transition to a circular economy. There was a high participation rate for those sessions among the 276 total conference attendees. Delegates included people from local and the provincial government, small business and industry, the nonprofit sector and individuals. Their positions in those organizations ranged from coordinator level to chief executive officer. Participants were asked to identify policies and systems changes they felt were needed to make the transition to a circular economy in Canada. Attendees were asked as part of that process what they thought was the one simplest action that could have the most impact in that change. Participants recorded their input on provided forms. These were collected at the end of each session and analyzed by the conference facilitation team. There was high percentage of contribution and a wide variety of input. In many cases, delegates offered similar insights. The following report summarizes those results. In May of last year, StewardChoice Enterprises announced their intention to launch a new Packaging and Printed Paper Stewardship Plan for producers operating in British Columbia. As part of the consultation process, StewardChoice has made revisions to the plan and seeks input from key stakeholders for expanding recycling services to a number of single and multi-family households that are not currently receiving producer funded services. The StewardChoice Plan proposes to service these communities; thereby fulfilling the BC government’s public policy objectives of province-wide coverage and shifting the cost of recycling to producers who generate PPP. By using an open-market approach, the plan presents producers with the opportunity to negotiate a tailored EPR service for meeting their regulatory requirements in BC. Given the desire of the BC Ministry of Environment to ensure a collaborative approach, StewardChoice will be hosting public consultations in addition to one-on-one stakeholder outreach. Neil Hastie, Development Director of StewardChoice, will be presenting new proposed changes to the and answering any questions during the webcast. Neil and Ken Friesen, Director of StewardChoice, will be taking questions from key stakeholders. Producers, recycling service companies, residential building owners, property management companies, NGOs and government officials are encouraged to attend the online consultation to learn more about the draft stewardship services plan and to provide constructive feedback about the proposed service. StewardChoice Enterprises Inc. is a subsidiary of Reclay StewardEdge, a national organization and a North American leader providing packaging stewardship solutions to consumer product goods organizations. Further information can be found at www.stewardchoice.ca. We invite you to join us for the RCBC Annual General Meeting (AGM) to be held at Surrey City Centre Library. When: June 26, 2015 at 10:30 a.m.
(10350 University Drive, Surrey, BC V3T 4B8). To assist us with our preparation, register your attendance by June 17, 2015 at http://rcbcagm.eventbrite.ca. This is to inform you of the results of the 2015-2017 RCBC Board of Directors election in the Non-Profit & Individual Sector. There were 2 positions available in the Individual category and 3 positions available in the Non-Profit category respectively. Alda Nicmans, current chair (Individual) is becoming past-chair and therefore is acclaimed under the bylaw 3.1.0. Thank you to everyone who participated in the democratic process by voting this year. The elected Directors in the Non-Profit and Individual sectors will begin their 2-year term and assume their responsibilities after the June 26, 2015 Annual General Meeting. The directors in the Business and Government Sector have 1 year remaining in their 2-year term. If you have any questions about the election process, please contact Raymond Gaudart, Nominations Committee Chair, at members@rcbc.ca. RCBC has 2 positions available in the Individual category and 3 positions available in the Non-Profit category respectively. The current chair (Individual) is becoming past-chair and therefore is acclaimed under the bylaw 3.1.0. Since there are more nominees than positions available in Individual & Non-Profit category, members must vote to fill the remaining board positions. The following board members have one year remaining in their two-year term and thus are acclaimed for the 2015-2016 year as per Bylaw 3.1.2. You should be receiving your voting package in the mail in the coming week which includes: a full listing of nominees with biographies, your ballot, and a stamped addressed return envelope. Please note that only members in good standing and the respective official member contact will be receiving a voting package. Ballots must be returned to RCBC by either mail or fax by Friday, May 22, 2015. To confirm your membership status, contact Ben Ramos, Member Services Manager at ben@rcbc.ca or at 604-683-6009 ext. 314. If you have any questions about the balloting process, please contact Raymond Gaudart, Nominations Committee Chair, at members@rcbc.ca. RCBC is seeking member input and insight into this and are inviting your participation with this online survey because of your support and interest with waste reduction. Your participation in this survey will assist to investigate opportunities to develop a formalized network to support the transition to a circular economy in BC and Canada through the collaborative efforts of the Recycling Council of British Columbia (RCBC), The National Zero Waste Council and affiliated stakeholders. This survey is short and should take approximately 10 minutes to complete. The survey will be open until May 4, 2015. Please also feel free to forward this survey onto anyone else in your network. Welcome to our newly approved members! The Recycling Council of British Columbia is now accepting nominations, until April 23, 2015, for the Board of Director positions in two sector categories, Non-Profit and Individual. If you are an RCBC member, in good standing, of a non-profit group or have an individual RCBC membership and are considering nomination to the Board of Directors, please read the 2015 RCBC Board Nominations Package carefully, so that you become familiar with the purpose of the organization and its system of elections and governance. The two year board term (per Bylaw 3.1.2) will run from June 2015 to May 2017. If you are interested in nominating a candidate please download the 2015 RCBC Board Nominations Package, complete the nomination form and submit it to the attention of Raymond Gaudart, Chair - Nominations Committee, no later than Thursday, April 23, 2015 by 4 p.m., by fax at 604-683-7255, by email at ben@rcbc.ca, or by mail to 10-119 West Pender Street, Vancouver, BC V6B 1S5. Assistant Deputy Minister Lori Hall announced the restructuring of Environmental Standards Branch within the Environmental Protection Division. As of March 23, 2015, a new branch focusing on Extended Producer Responsibility (EPR) will be in place and operational. ADM Hall described Cameron Lewis, who will be assuming the role of Executive Director of the Waste Prevention Branch, as a highly sought after leader within the public service, who has an undergraduate degree in Political Science and a Master’s Degree in Public Administration. Director Lewis started his career with the Province as a member of Treasury Board Staff, in what is now the Performance Budgeting Office, in 1998. He has served as a budget Manager with the Ministry of Management Services, in various director and executive director roles with the Ministry of Energy and Mines focussing on oil and gas development, and most recently with the Ministry of Justice, Emergency Management BC, in the area of emergency management. The Environmental Standards Branch will continue to be led by Kris Ord, as the Acting Executive Director and will be comprised of the Clean Communities, Clean Technologies, Clean Air and Integrated Pest Management sections. During the transition from one branch to two, there will be some minor shifting of work within each of the branches. ADM Hall emphasized that Extended Producer Responsibility is a very important program within the Ministry and that the restructuring will provide the program with leadership and capacity for the future. RCBC will provide further details on the EPR Branch as they become available. (February 11, 2015) David Ranson, Executive Director (ED) of the Environmental Standards Branch, Environmental Protection Division of the BC Ministry of Environment, let us know today that he will be leaving to take on a new role in the public service. David, who stepped into his current position in 2009, has steered the Ministry’s course through significant changes in the area of extended producer responsibility (EPR). A lawyer by profession, David led the branch through a number of additions to the Recycling Regulation, extending industry responsibility to numerous product categories, the last being packaging and printed paper. He’ll be leaving for his new position as Executive Director of Business Development with BC Parks in the Ministry of Environment on February 23. A temporary Executive Director will step in at that time until a permanent appointment is made. If announced in time, RCBC plans to introduce the new ED at its May 6-8 conference in Whistler. Product Care / ReGeneration held the first public consultation webinar on Dec. 8, 2014 and will hold a second public consultation webinar on January 14 to discuss proposed targets for collection rate and collection site accessibility targets for certain products. A temporary Environmental Resources Assistant summer student position is available for the summer 2015 in the Recycling and Waste Management Division at the Cowichan Valley Regional District (CVRD). Thank you to all our RCBC members who supported us this past year. 2015 Membership Renewal Notices will be mailed out this week. For more information, contact Ben Ramos, Member Services Manager, at members@rcbc.ca or at 604-683-6009 ext. 314. Product Care/ReGeneration will be holding a public consultation webinar to discuss proposed targets for collection rate and collection site accessibility targets for the following products for which targets are not already specified in the 2012 Plan. You are invited to attend a public consultation webinar on December 8, 2015. Meeting materials will be made available in advance of the webinar. In addition to participating in the webinar, you are invited to submit comments in writing prior to December 22, 2014. Full event details are available here. Canadian Wireless Telecommunications Association (CWTA), is seeking input on its revised Recycle My Cell (RMC) Stewardship Plan for BC. RMC is a cell phone recovery program that deals specifically with mobile devices that were primarily manufactured to connect to a cellular or paging network. Examples of such devices include cellular phones, wireless smartphones, superphones, phablets, wireless PDAs, removable external aircards and pagers. The revised Recycle My Cell Stewardship Plan available at: http://cwta.ca/wordpress/wp-content/uploads/2011/09/BC_RMC-Stewardship-Plan_2014-to-2019_Draft_For-Consultation_October-17.pdf. The public and interested stakeholders are invited to submit their comments and feedback on the revised plan by December 30, 2014. CCME Waste Management Webinar: "Improving Canada's Record on Waste"
The Canadian Council of Ministers of the Environment (CCME) is holding a webinar to provide an update on its recent work on waste management. The webinar will review CCME's current priorities for waste and provide an overview of recent publications on extended producer responsibility and the state of waste management in Canada. To register for the webinar, visit: https://onecast.thinkpragmatic.com/ses/HatBOHHR09nvTq0vdD2XXA~~. Participants will require a computer with speakers to hear the webinar. For more information on CCME's work on waste, visit http://www.ccme.ca/en/current_priorities/waste/index.html. Notice of Public Consultations - Recycle My Cell, Switch the Stat, BDL, and Call2Recycle Canada Inc. Recycle My Cell, Switch the ‘Stat, Brewers Distributor Ltd. and Call2Recycle Canada, Inc. are in the process of renewing their stewardship plans with the British Columbia Ministry of Environment for 2015-2019, and the following public consultations will be held throughout the province. For in-person and webinar registration, download the full schedule. BC Used Management Association (BCUOMA) invites you to review and comment on its updated Stewardship Plan. BCUOMA has been successfully collecting and recycling used oil, containers and filters since 2003, and anti-freeze and anti-freeze containers since 2011. This five year review and consultation of our stewardship plan will help us readjust and refine our processes and help us meet our ongoing commitment to continuous improvement. Your input into our new plan will help make this program will help us build on our current successes, and reach even better environmental outcomes. Brewers Distributors Ltd. (BDL), which operates the stewardship program for refillable glass beer and cider bottles and all beverage alcohol sold in cans, is in the process of renewing its Schedule 1 stewardship plan for the period 2015 - 2019. The draft plan renewal is posted for public comment from now until December 1, 2014 and can be found at: www.EnviroBeerBC.com/reports-links/. The public consultations are being held in conjunction with Call2Recycle, Recycle My Cell and Switch the ‘Stat. Further information and registration details can be found at www.EnviroBeerBC.com/reports-links/. The National Zero Waste Council is pleased to announce an upcoming webinar as part of its Member Services. Our webinar series are meant to support dialogue, knowledge transfer, and collaboration in support of a waste prevention agenda in Canada. This webinar will feature three speakers from leading industrial design institutions and design firms in Canada and the US that will speak to sustainability or life cycle assessment frameworks that best address waste prevention and reduction. What key criteria or questions do these frameworks present, that might assist a designer and/or company best incorporate waste reduction and prevention into the design of a product or packaging? What considerations are critical to operationalizing this criteria? What trade-offs might be faced? We're proud to announce the return of TRAILER TRASHED, our environmental short film competition - with a twist! This year, we're challenging you to show British Columbians just how easy it is to recycle their electrical products. Create an awesome movie trailer and you could take home cash prizes - and all the glory you can handle! Contest details, past submissions, and more can be found at www.trailertrashed.org. The B.C. Chapter of the Solid Waste Association of North America is offering a number of $1000 scholarships to encourage students studying in disciplines related to solid waste management and environmental protection. Completed applications must be received on or before October 15, 2014. Applicants must be registered in a full course of studies in an environmental management or a related program at a recognized post-secondary institution in British Columbia or the Yukon. Applicants must have completed their first year of post-secondary studies. For more information and to apply, see application form (pdf). In May of this year, StewardChoice Enterprises announced their intention to launch a new Packaging and Printed Paper Stewardship Plan for producers operating in British Columbia. As part of the consultation process, StewardChoice seeks input from key stakeholders for expanding recycling services initially to multi-family dwellings currently not being serviced by packaging and printed paper stewards. Given the desire of the BC Ministry of Environment to ensure a collaborative approach in exploring the strengths and challenges of this draft stewardship plan, StewardChoice will be hosting public consultations, in addition to one-on-one stakeholder outreach. For more information and to register, see the full announcement from StewardsChoice. On June 26, 2014, BC-based company StewardChoice Enterprises Inc. published their draft stewardship plan for their new EPR (Extended Producer Responsibility) service. The plan details its market based approach for expanding producer-funded collection and recycling services for packaging and printed paper in BC. To review the plan, see stewardchoice.ca. StewardChoice, a subsidiary of Reclay StewardEdge, has announced a consultation for a new packaging and printed paper program in BC. StewardChoice will provide solutions for producers who are obligated to recover 75% of their packaging and printed paper waste as per the latest amendment to the British Columbia Recycling Regulation. The service will begin by increasing recycling amongst multi-family building residents who currently do not have access to a producer-funded recycling program in BC. Consultation will begin mid-June 2014 and StewardChoice is planning to begin operations in 2015. For more information, see www.stewardchoice.ca. BDL will be holding a consultation on the 2014-2019 renewal of its Schedule 1 (beverage containers) stewardship plan at the end of the RCBC conference in Whistler next week. This consultation will take place on Friday, May 30 at noon in the Saskatchewan Room at the Fairmont Chateau Whistler. Registration is not required, however confirming your attendance through info@nationalbrewers.ca would be greatly appreciated. The proposed stewardship plan will be posted for public comment in early June – this consultation will be held before the plan is available publicly. Further consultations throughout the province will be taking place in July. Further details on dates and locations will be coming out shortly. On May 19, 2014, Multi-Material BC (MMBC) will launch a new packaging and printed paper recycling program in BC, enabling British Columbians to recycle milk cartons, plant pots, aluminum foil packaging, drink cups and many more items through their curbside or multi-family building recycling services, or at local depots. The MMBC program shifts the responsibility for funding recycling services for blue box recyclables from municipal taxpayers to the businesses that manufacture or supply those items to residential consumers. Multi-Material British Columbia (MMBC) is a non-profit industry-led and financed organization that will assume responsibility for managing residential packaging and printed paper recycling on behalf of industry. More information, including lists of MMBC collectors and members, is available at www.multimaterialbc.ca. This is to inform you of the results of the 2014 RCBC Board of Directors election in the Business sector. The government sector nominees were acclaimed as there were fewer nominees than there are positions available. Since only 2 nominations were received for the government sector, the RCBC Board of Directors may, at its discretion, appoint a third director to fill the vacancy according to ByLaw 3.4.4. Thank you to everyone who participated in the democratic process by voting this year. The elected & acclaimed Directors in the business and government sectors will begin their 2-year term and assume their responsibilities after the May 29th, 2014 Annual General Meeting. The Directors in the Individual & Non-Profit sector have 1 year remaining in their term. RCBC members are invited join us at for this year's our Annual General Meeting (AGM) at to be held at our 40th Annual Zero Waste Conference. When: May 29, 2014 at 11:45 a.m.
(4599 Chateau Blvd, Whistler, BC). Please RSVP to conference@rcbc.ca if you are attending the AGM only. The Agenda and the copy of the 2013 AGM minutes will be distributed prior to before the meeting event. Multi-Material BC press release on the new packaging and printed paper program. This April, Canadian office and retail properties will be able to participate in a national study that will gather solid waste generation and diversion rates to benchmark performance and share best practices. The study is led by Recycling Council of Ontario (RCO), a not-for-profit organization solely focused on solid waste issues, along with collaborators from industry, academia and regional recycling councils. Through an online survey, 2013 waste generation and diversion data will be gathered to inform an average performance by building-type, expressed as: diversion rate and capture rate. Additional qualitative information will be collected to draw correlation between performance and management practices, thus helping inform best practices in the future. Results will be published as anonymous. Aggregated data along with detailed analysis, conclusions and recommendations will be reported in the last quarter of 2014. For more information, view the study overview. Version 2.0 for BC Recyclepedia app for IPhone is now available in the app store. It features an updated look, new mapping feature, and the ability to search by repositing the map. Download the latest version in the app store. The Canadian Electrical Stewardship Association (CESA) is a national not-for-profit stewardship agency operating the ElectroRecycle small appliance and power tool recycling program in BC, in adherence with the BC Recycling Regulation. ElectroRecycle is operated according to CESA’s stewardship plan, approved by the BC Ministry of Environment (BC MoE) in July 2010. The program launched on October 1, 2011. As a supplement to the approved stewardship plan, CESA committed to submitting collection rate targets to the Ministry of Environment in the Spring 2014. CESA would like to invite you to attend the public consultation webinar for more information on the proposed collection rate targets. You are also invited to submit written comments and if you are unable to attend the webinar, you will be able to find materials regarding the targets posted on www.cesarecycling.ca shortly after the consultation. To register for the webinar or to submit written comments, please contact Shannon White at info@cesarecycling.ca. The deadline for written comments is May 13, 2014. RCBC has 2 positions available in the Business category and 3 positions available in the Government category respectively. The current chair, Clint Mahlman - London Drugs (business), is becoming past-chair and therefore is acclaimed under the bylaw 3.1.0. Since there are more nominees than positions available in Business category, members must vote to fill the remaining board positions. The government sector nominees are acclaimed as there were fewer nominees than there are positions available. RCBC members in good standing will be receiving their voting package in the mail in the coming week which includes: a full listing of nominees with biographies, your ballot, and a stamped addressed return envelope. Please note that only the official member contact will be receiving a voting package. Ballots must be returned to RCBC by either mail or fax by Friday, April 25, 2014. Multi-Material BC (MMBC) announced Green by Nature EPR (GBN) - a new organization founded by leaders in the recycling industry in British Columbia - has been selected to manage the post-collection system for MMBC's residential packaging and printed paper recycling program, which will begin delivering services to approximately 1.25 million households on May 19, 2014. GBN is a new organization founded by three industry leaders with over 100 years combined experience - Cascades Recovery, Emterra Environmental, and Merlin Plastics. A material recovery facility in Nanaimo that will sort and prepare collection material for shipment to downstream processors and end markets. Read the full press release from MMBC. The Recycling Council of British Columbia is now accepting nominations, until March 24, 2014, for the Board of Director positions in two sector categories, Business (2 positions available) and Government (3 positons available). The current chair (business) is becoming past-chair and therefore is acclaimed under the bylaw 3.1.0. Nominations for annual elections are open to those who were members in good standing in the year prior to the year in which the election is held. If you are an RCBC member, in good standing, in the business or government sector and are considering nomination to the Board of Directors, please read the 2014 RCBC Board Nominations Package carefully, so that you become familiar with the purpose of the organization and its system of elections and governance. The Ministry of Environment intends to implement an administrative penalty program under the Environmental Management Act and the Integrated Pest Management Act. This notice is intended to draw your attention to an information paper that has been posted to the Ministry website to inform potentially affected stakeholders and the public. Administrative penalties are an enforcement tool increasingly being used by regulatory agencies in BC and across Canada. Specifically, administrative penalties are financial penalties that can be imposed on individuals and companies who fail to comply with the Ministry’s regulatory requirements, with orders issued under the Acts, or with terms and conditions of authorizations. Administrative penalties would fill a gap in the Ministry’s existing enforcement toolkit, occupying a middle ground between warnings and violation tickets issued for minor contraventions, and criminal prosecutions for more serious offences. Administrative penalties would be issued by designated Ministry officials. The enabling statutory authorities for administrative penalties already exist in the Environmental Management Act and the Integrated Pest Management Act. All that is required is to complete the development of a detailed regulation outlining the specifics of the program. The Ministry anticipates that the new regulation will be brought into force in March 2014. You are welcome and encouraged to forward this information to others whom you feel should be advised of the proposed regulation. Comments or questions about the administrative penalties program can be submitted via email to ENVadminpenalties@gov.bc.ca before February 21, 2014. The Province is taking steps to reduce red tape for small businesses impacted by a new recycling program which shifts costs from B.C. taxpayers to industry. perate as a single point of retail sale and are not supplied by or operated as part of franchise, a chain or under a banner. This means less than 3,000 businesses out of over 385,000 in the province will be affected by this program; less than one per cent of the total number of business in B.C. Multi-Material British Columbia (MMBC), the industry-led stewardship organization responsible for the recycling program, will also be giving an option to businesses for an annual flat fee if they are considered a low volume producer of packaging and printed paper. Businesses producing between one and five tonnes can pay a pre-determined recycling fee and will not have to provide detailed reporting. Read more. Member News: Genesis Recycling is now merged with SIMS Recycling Solutions Canada Ltd.
RCBC member Genesis Recycling in Langley, BC is now merged with Sims Recycling Solutions Canada Ltd. For more information visit their website. Belkorp Environmental Services Inc. today announced that it plans to invest approximately $30 million to develop a 260,000 tonne capacity advanced material recovery and recycling facility in Coquitlam. The advanced material recovery facility will create up to 80 new green jobs, and ensure that more than 80% of customers' unsorted waste is diverted from disposal. The proposed facility is to be built in South Coquitlam, at no cost to municipal residents. See full press release from Belkorp Environmental Services Inc. The Board of Directors of BCUOMA has appointed David Lawes as Executive Director. See full announcement from BCUOMA. While there is no compelling need for new scrap tire processing capacity in BC and TSBC is not actively seeking a new processor, a new policy on becoming a new scrap tire processor in BC is being considered to deal with any applicants that come forth. Policy Statement: Anyone wishing to become a Processor will be required to achieve "more new value from old tires" through (1) product/market innovation and/or (2) processing innovation, either of which must significantly reduce the incentive costs without jeopardizing TSBC's Stewardship Program stability and environmental results. TSBC is seeking comments on the complete document "Becoming a Processor - The Policy, Requirements, Process, Steps, and Fees." Email your comments to BecomingaProcessor@rcbc.ca. Comments accepted until February 28, 2014. Thank you for your continued support of RCBC through this past year. You should be receiving your 2014 Membership Renewal package shortly in the mail. If you have any questions regarding your renewal package, please contact Ben Ramos, Member Services Manager, at 604-683-6009 ext. 314 or at members@rcbc.ca. ElectroRecycle, B.C.’s small appliance and power tool recycling program, hosted its first-ever “Mo Must Go” shave-off event this past Saturday, November 30th at the Vancouver Art Gallery. Mo Bros were invited to come down and drop off their old and unwanted electric shavers and trimmers for recycling while saying au revoir to their month-long facial friend in style with a free hot shave courtesy of JD’s Barbershop and ElectroRecycle. During the month of November, ElectroRecycle set out to donate $5 to prostate and testicular cancer research for every electric and rechargeable razor, beard trimmer and hair shaver collected, up to a maximum of $10,000. The “Mo Must Go” event was the program’s way of capping off the month of collections with a bang. A total of 26 men braved the rain to receive their free hot shaves, including Docc Andrews of JR FM. A 20′ by 30′ tent, propane heaters, free coffee and popcorn, and good cheer kept the chill at bay. Plus, for every shave, ElectroRecycle donated and additional $20 to Movember. Numbers for the month-long collection are still being tallied, but updates will be shared as soon as they become available. Electric shavers, razors and trimmers make up 1.5 per cent of total items collected by ElectroRecycle. Over 2,000 men in Vancouver alone use electric razors. 16 per cent of Canadians who use a razor, opt for an electronic variety. Blessed with a thick beard? The thicker the beard, the more often you need to replace your electronic shaver. This is a recycling business in BC that picks up plastic from businesses for free in Metro Vancouver. Westcoast is working with Multi-Materials BC, a government agency, to provide sustainable recycling in BC. With its short 5 year history, Westcoast has become the largest exporter of plastic recycling in BC providing an avenue for other recyclers to market their products. Westcoast is always trying to identify new products for its growing list of recyclables and won the Canadian Plastic Industry Association’s Award for Contributing to Sustainability in May 2013. Westcoast has also won the Consumer Choice Award for Best Green Business 3 years in a row for Metro Vancouver. Westcoast recently sponsored the Great Canadian Shoreline Cleanup. It has entered a new area of recycling recently with The Kidney Foundation of BC’s Recycle for Life, organ donor program allowing Westcoast’s customers to contribute a portion of earnings to the Foundation. Westcoast is Making a Difference! Though the voting period is now over, stay posted for the awards ceremony in February. For more information, click here. Member News: deBrand Services Has Moved! New address: 672 Derwent Way, Delta. The office phone number remains the same at 604-638-8998. In late August of 2013, Nu-Plastic Services of Surrey, BC went ‘live’ with a new electronic collecting and reporting system they’d been testing for a number of months. After receiving confirmation from the Stewardship Program Executive Director that the test reports coming out of the electronic system were identical to the paper collection reports the drivers were completing, Nu-Plastic was given the green light to stop using the paper system altogether. Now, three months later and without the paper reporting, the results are in – and they’re very very impressive.